The Group of 20 (G20) is a “club” of nations with significant influence. There is a significant democratic deficit in the G20 since its decisions and actions are not governed by international law and it is not accountable to representative bodies. The Group of 20 (G20) is a “club” of nations with significant stature and influence. Its 19 individual member countries represent roughly 10 per cent of the 193 member countries of the United Nations. 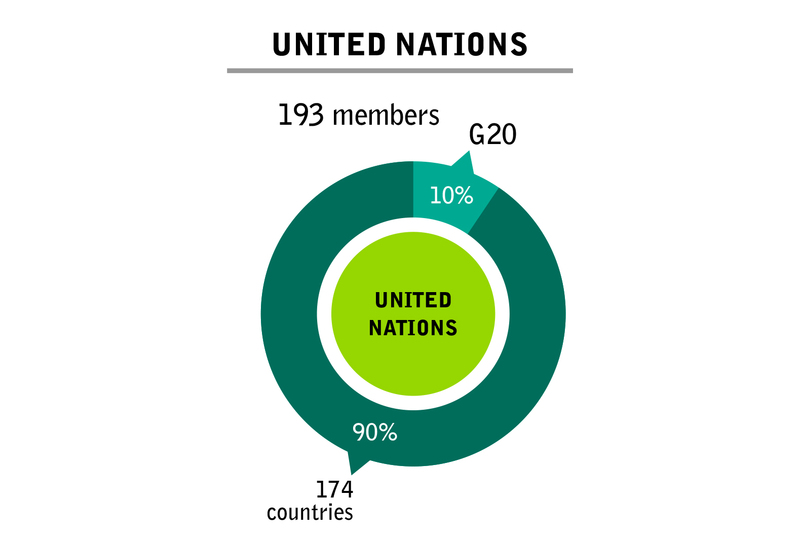 The other 174 countries are excluded from G20 membership, with one exception. The 20th member of the G20, the European Union, is a regional one with one seat representing 28 countries. France, Germany, Italy, and the United Kingdom are also individual G20 members. The 19 individual G20 country members are among the 33 countries with the largest gross domestic product around the world. For instance, several countries, including Egypt, Thailand, Nigeria, Poland and Iran, have larger economies than South Africa, a G20 member. (see Fundamental 1: “Group of 20 (G20) – In a Nutshell”). In fact, the composition of the G20 can be traced back to then-U.S. Treasury Secretary Lawrence Summers: in 1999, working with his Canadian and German counterparts, he identified 19 countries with large economies and friendly relations to inform global economic and financial policy. Even today, there are no objective criteria for a G20 membership. The G20 declared itself as the “premier forum for international economic cooperation” which implies that it acts as a global steering committee in relation to an array of global governance institutions, including those with more legitimacy due to their nearly universal membership (i.e., the UN). Created in 1999, the G20 met at the level of Finance Ministers and Central Bank Governors to address the aftermath of the East Asian Financial Crisis. In 2008, after the global financial crisis exploded, the G20 began summit meetings at Heads of State level. While the summits usually take place on an annual basis, the “Finance Track” comprised of Finance Ministers and Central Bank Governors meets throughout the year. (See Fundamental 1). Similarly, Foreign Ministers, as well as Ministers of Agriculture, Energy, Employment (among others) gather for meetings between the summits. Each head of state is represented in the G20 by his or her “Sherpa” or personal representative and, in addition to the “Finance Track”, there is an important “Sherpa Track” of meetings. Overall, more than 70 meetings take place every year. Every G20 Presidency has the right to invite guests, in addition to Spain which is a permanent guest. So far, the German G20 Presidency has invited the Netherlands and Norway, plus African guests. During the Chinese G20 process, the heads of Egypt, Kazakhstan, and Thailand were guests as well as the Chairs of ASEAN (Laos); the African Union (Chad); NEPAD (Senegal); and the Global Governance Group (3G), Singapore. The 3G is one channel for excluded UN member countries to express their views. Representatives of the guest countries are allowed to participate in the summits, as well as in the ministerial and working groups. Still, their participation is a rather symbolic expression, which does not substantially change the monopoly of decision-making by G20 members. Who wields power in global institutions? The IMF and World Bank are "Bretton Woods institutions" which were created in Bretton Woods, New Hampshire in 1944 during the United Nations Monetary and Financial Conference. The IMF was intended to foster international financial stability, while the World Bank was intended to loan money to war-ravaged and impoverished countries for reconstruction and development projects and, thus, build the capacity of countries to trade. The G20 is not embedded in relationships of accountability to more representative (albeit very imperfect) global institutions, such as the ones in the box above. This democratic deficit seems to be intentional. Essentially, alternatives to creating the G20 would have been to establish a special committee of the UN Economic and Social Council (ECOSOC) or to expand the powers of the International Monetary and Financial Committee (IMFC), which also advises the IMF Board of Governors. 16 of the 24 members of the IMFC are already G20 members. 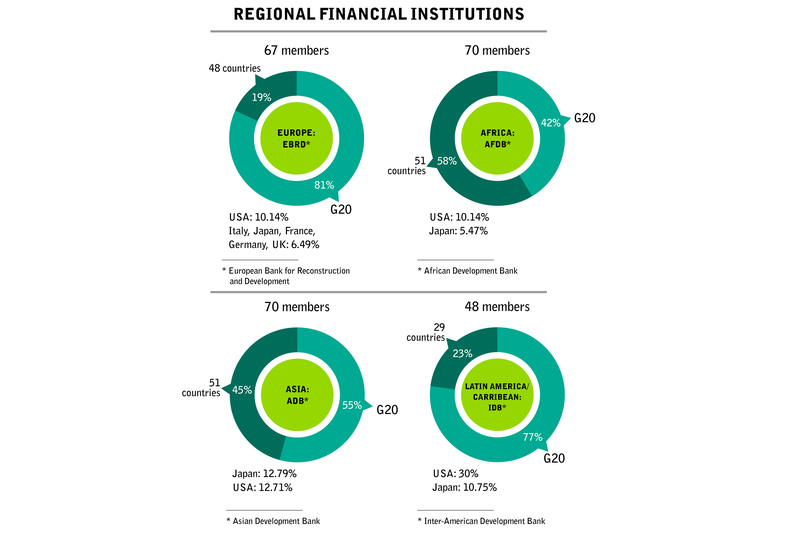 Although the IMF woefully under-represents developing countries, it has a structure of accountability to all 186 member countries. In addition, the G20 also could have relied on the Development Committee of the World Bank and the IMF instead of creating its own distinct G20 Development Working Group. There is also a democratic deficit in more representative institutions. Most emerging nations and developing countries frequently demand a redistribution of voting rights in the IMF and the World Bank, in particular. They especially criticize the dominance of the United States, Europe, and Japan as the largest shareholders (those that contributed most of the capital). Nevertheless, the smallest countries still have representation in the IMF, World Bank, and regional development banks. China’s contribution to global economic growth (by nominal GDP) over 2014-15 was 51 per cent, compared to the U.S.’s 31 per cent and while the U.S. economy is much larger than China’s in nominal GDP terms, China’s economy is larger than that of the U.S. in PPP (purchasing power parity) terms. These power relations are not adequately reflected in the voting proportions of the traditional development banks. 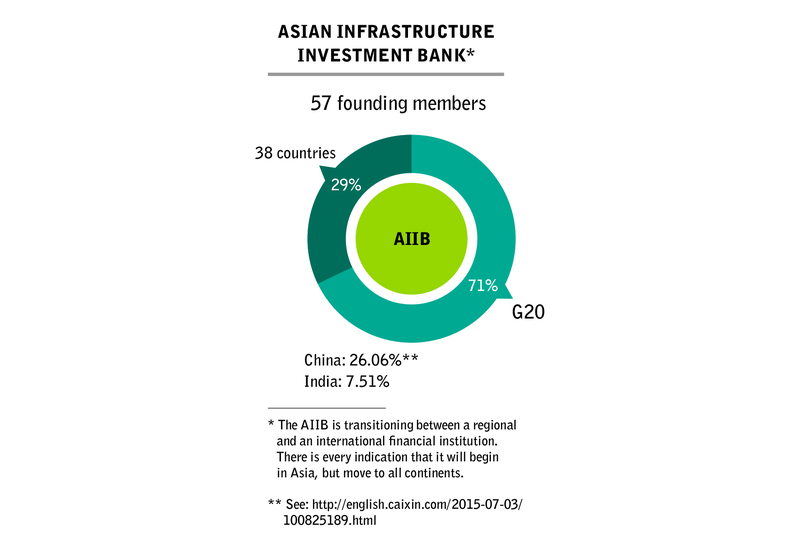 Consequently, China’s launch of the AIIB did not come as a surprise . Along with G20 Leaders, the Finance Ministers and Central Bank Governors have key roles in managing the high priority issues on the G20 agenda, such as growth, investment, infrastructure, macroeconomics, international taxation, and anti-corruption. The Finance Ministers such as those of China (Lou Jiwei), Germany (Wolfgang Schäuble), Argentina (Alfonso Prat-Gay), India (Arjun Ram Meghwal), and the U.S. (Steven Mnuchin) do not only make decisions within the G20, but also govern the IMF and the major national, regional, and multilateral development banks. As a result, where there is consensus among the Finance Ministers of the G20, their consensus can flow through the international institutions that these same individuals govern. This is occurring even though, in the case of the International Monetary Fund (IMF), there are 170 members in addition to the 19 individual G20 country members. For instance, in the IMF, G20 Finance Ministers hold almost 78 per cent of all votes but also have an additional channel of influence through the G20’s input to the institution. In this way, the G20 nations, which already dominate the IMF, augment their power. There is a significant democratic deficit in the G20 since its decisions and actions are not governed by international law and it is not accountable to representative bodies, such as the United Nations. Notwithstanding, the G20 is far more representative of the multi-polar world order than is the Group of 7 (G7), comprised of the U.S., U.K., Canada, France, Germany, Italy, and Japan. With an evolving list of members, the G7 has met for over 40 years, primarily to coordinate economic policies. Until 2014, Russia was also a member (see Fundamental 2: ”The G7 and G20 in the Global Governance Landscape”. As with the G7, the G20 is a form of “club” governance. Many policy-makers believe that there is a trade-off between legitimacy (number of member countries), on the one hand, and effectiveness, on the other. They claim that the G20 is more effective because of its informal nature, including the lack of a secretariat, eligibility requirements for membership, a charter, or lines of accountability. However, opinions differ sharply when it comes to the lack of accountability towards non-members in an era of rising inequality. While some aspire towards a neoliberal orientation of policies that serve few, others strive for economic policies that are oriented towards global justice and prioritize the people and their well-being and livelihoods . The current structure of global economic governance is dominated by the G20 countries, which control the major national, regional, and multilateral development banks and, therefore, can eclipse the voices of non-G20 member countries. For instance, when the same “cast of characters” – Finance Ministers and/or Central Bank Governors – sit in meetings of the G20 and other institutions, there is a risk that they will act as a caucus that brings pre-cooked policies into institutions with universal membership. The G20’s lack of transparency makes it almost impossible for non-member governments and civil society to influence its decisions. The agendas of multiple ministerial meetings are only published partially or after priorities have been determined, although the private sector is granted privileged access to information. It is the custom for each G20 host country to determine rules for transparency and participation. In many countries, there is very limited space for civil participation and debate, while dissent or protests are sometimes criminalized. This is unacceptable. The global community has a right to trust in the openness and accessibility of G20 processes regardless of which country holds the presidency. The German presidency has created several opportunities for dialogue with different engagement groups (see Fundamental #4: ”Engagement Groups”). While this is positive, such dialogue is not usually fully informed and civil society often lacks the opportunity to engage directly with decision-makers. Whichever country hosts the G20 is also opening the door to protest. Therefore, a civil alliance outside of the scope of engagement processes has formed, mobilizing for protest against G20 policies and its summit in Hamburg (see German protest website here). The same dynamic has occurred in previous G20 presidencies. In the case of Germany, some elements of this alliance want to mobilize against the presence of autocrats, such as Vladimir Putin and Recep Tayyip Erdoğan, whose countries have recently experienced harsh restrictions of civil liberties; protestors will also not welcome President-elect Donald Trump to their city. 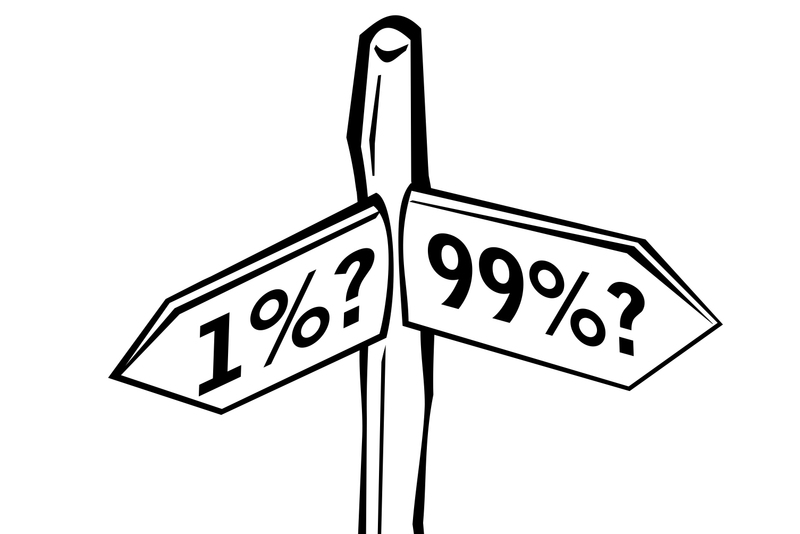 Prior to the protest, an international summit of the alternatives, organized by civil initiatives and non-government organizations, is taking place, providing a broad platform for discussion and action in regard to criticism of and alternatives to the neoliberal model of globalization. It will stress international solidarity and exchange, as well as best practices for people-centered and sustainable alternatives. This article is part of our dossier "G20 in Focus". Even if one includes the additional 24 European countries represented by the EU, only 22% of UN members are represented in the G20. Voting systems and actual practice may diverge as described by Posner and Sykes in “Voting rules in International Organizations”, University of Chicago Law School, Coase-Sandor Institute for Law and Economics Working Paper No. 673, January 2014. Available at: http://www.imf.org/external/np/exr/facts/groups.htm#IC. 173 countries belong to the World Bank’s soft loan arm, the International Development Association (IDA). The 30 member states of the Global Governance Group are the Bahamas, Bahrain, Barbados, Botswana, Brunei, Chile, Costa Rica, Finland, Guatemala, Jamaica, Qatar, Kuwait, Liechtenstein, Luxembourg, Malaysia, Monaco, Montenegro, New Zealand, Panama, Peru, the Philippines, Rwanda, San Marino, Switzerland, Senegal, Singapore, Slovenia, Uruguay, the United Arab Emirates and Vietnam. More information available at: www.mfa.gov.sg. Ironically, many G20 policy-makers express concern that the G7 pre-cooks policies and presents them to the G20 for approval.